Villagers explain why they risk their lives moving ordnance. This cluster munition should never have been moved, but we found it sitting on a tree stump. Obviously, some villager carried it from the place where it was found and placed it on the stump. Villagers know the risks associated with handling old American ordnance; they accept those risks because they want to keep others safe. 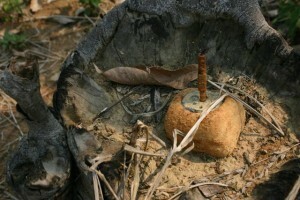 Since the war ended, villagers in May District, Phongsali Province, have never had any help with unexploded ordnance. UXO/Lao does not serve the province. Nor does the Mines Advisory Group (MAG) nor any other large humanitarian clearance organization. We Help War Victims was the first organization to conduct clearance in Sop Houn Village. With staff and equipment provided by the New Zealand-based clearance company PCL, we removed or destroyed 105 pieces of dangerous ordnance from that village. In this video Sop Houn Villagers explain how and why they move ordnance that they know could explode when disturbed.